Cats can be very particular about their surroundings and most get very stressed taking that trip to the cattery. With our cat feeding service they can stay in their own environment in familiar surroundings and keep a normal routine. We will feed your cats, ensuring they get fresh water daily and clean their litter trays. We offer one to one care while your away, which includes play interacting with them and grooming them if that is what your cat is used to. One of our sitters will come round to your home before you go away and talk through the cats routine and collect a set of keys. We can visit once or twice per day while you are away, whichever you would prefer. Our small pet feeding service is for any caged/hutched pets. Anything from rabbits/guinea pigs to geckos and birds. We can come once or twice a day to feed and interact or play with your pet if needed. One of our pet sitters will come round to your home to meet you and talk through your pets routine and collect a set of keys. This service provides extra security when you go away and will give your pet that extra care and attention in the comfort of their own home. One of our sitters will stay in your house and look after your pets and home. This is ideal for dogs and also cats that are used to someone being around a lot of the time and prefer a good solid routine. We are also more than happy to water plants, take out the bins and pick up the post. One of our pet sitters will come round to your home to meet you and talk through your pets routine and discuss any domestic duties that may be needed. we will also collect a set of keys. Your dog will stay at the pet sitters home. So unlike kennels, your dog will be treated like another member of the family and have the freedom of a house and garden. We have pet sitters with out dogs of their own so your dog can be boarded alone. You will need to provide the dogs food for the duration of there stay. We will ask you to drop your pet off and pick them up again from the pet sitters home. If you need your pet to be picked up or dropped off then this may be arranged at an additional cost. This service is for all caged/hutched pets. Our pet sitters are able to look after your pet in their home. 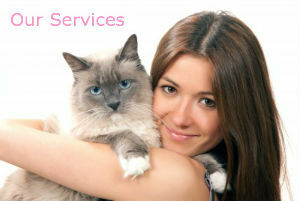 You can discuss with the pet sitter all about your pets daily routine and how you would like them to be cared for. You will need to provide food and bedding material for the length of there stay. We will ask you to drop your pet off and pick them up again from the pet sitters home. If you need your pet to be picked up or dropped off then this may be arranged at an additional cost. This is ideal for dogs that may have to be left on there own for a long period of time during the day. Dogs need mental stimulation and of course they like nothing more than going for a walk. We are here to help if you are at work all day, need to go out for the day or just have other commitments. The following services will be carried out by a Veterinary Nurse. Administering Flea and Worming Treatment.